A mod style geometric square of 14K gold makes up this neat modernist tie tack for men, circa late 50s early 60s. 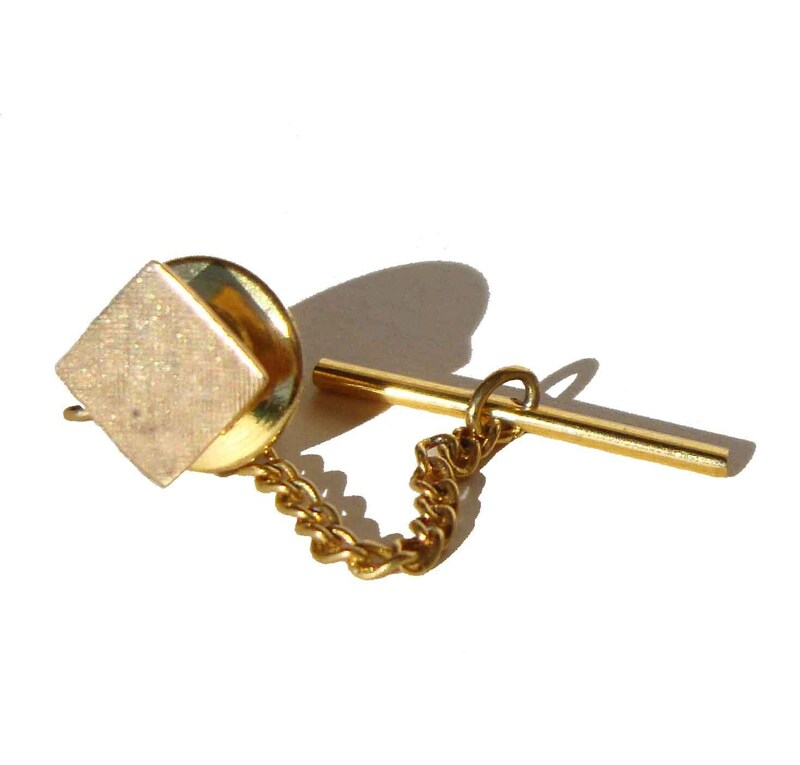 The petite sized tie pin is square in shape with a Florentine finish, and is comprised of 14K yellow gold, and accompanied by a goldtoned spring loaded clutch and chain bar. The stud or pin portion itself measures approximately ¼ of an inch square, is marked “14K”, and weighs 3.4 grams total in its entirety. This tie clip is beautiful and was the perfect gift for a friend! HepCatVintageNY worked with me to have the item shipped in a timely manner which made all the difference. * PayPal and Direct Checkout are accepted. Because of the nature of vintage items, all sales are final. However, we are happy to help you determine fit prior to your purchase, and provide additional measurements and/or other information as needed. Please send us a convo with any questions. * Shipments are made worldwide, three times a week via USPS First Class and Priority Mail. Buyers in Germany, please see note below. * Please note that these fees (VAT, GST, etc) are *not* included in the purchase price, in spite of the statement added by Etsy to all listings on the site. * All items ship via First Class Mail International with third party insurance. *** GERMANY*** -- Buyers in Germany, please note that your purchase can take 8 or more weeks for delivery. Please feel free to send us a convo.